Hello all, I am Pranav Kamesh S, studying in class 12 in Maharishi Vidya Mandir, Chennai. 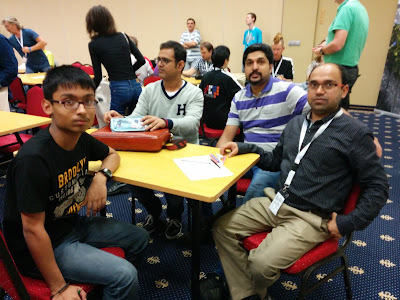 I represented India in the 11th World Sudoku championships in Senec, Slovakia. I am here to share my experience on my first wsc. I left from Chennai early on October 16th, (accompanied by my father as well as the other participants from Chennai, namely Rakesh Rai, Kishore Kumar and Ashish Kumar) and reached New Delhi at noon.We then took the flight from Delhi to Vienna and reached there at about 6:30 in the evening Vienna time. The organizers had arranged for a bus for our travel from Vienna to Senec, which took about 2 hours. I was indeed disappointed to miss the opening ceremony. We reached Hotel Senec and had our dinner. Being vegetarian, I did have a hard time on the food front, throughout the trip. After that, we attended the Q and A session, which was a very trivial matter. The instruction booklet was pretty clear, so i had no doubts. I must add that i was the only one from India aged below 18. But i must also state, in the same breath, that i felt very comfortable hanging out with my teammates, and i am very grateful to them for making me feel at home. So, i got back to hotel cosmopolitan, where i was put up along with my father and had a good night's rest. I had to be on top form the next day, and this was the best way to ensure it. The weather was pretty cold (good) throughout the day and night. Day 1 of WSC dawned. I was up early and made it to the hall quickly. Rd 1 was a 40 minute rd of variants with 14 Sudoku Puzzles of 7 types. I strangely felt no nerves and even though i did not set myself ablaze in glory, i felt i had done well for a first WSC round, solving 6 Sudoku Puzzles, 3 of which were high pointers. I fancied myself in the next round, with classics being my overwhelming strength. Out of the 11 classics to be solved in half an hour, i managed to solve 7, with some high pointers included. After this rd, i felt i could have done better, but was happy with my performance. The next rd was the big one of the day, with 16 Sudoku Puzzles containing common variants to be solved in 70 minutes. I totally bombed this rd, getting only 196 pts out of the 800 on offer. I think i totally underestimated the quality of the puzzles and duly paid the price. Every single puzzle had a soul and was hard to crack. Now that I think, not many Sudoku Puzzles were giveaways. You had to earn each and every point in every round. Later, I learned that excepting 2 or 3 solvers,many others did not finish most of the rds in time. I was pretty down and i felt that I had absolutely blown my ranking. Next round was a short 25 minute rd which in hindsight, i did OK, though i should have done better,considering it was mainly a classic samurai. We had a lunch break in which i felt pretty miserable,of which i don't remember much. The next one was the true logical rd,the innovative aliens rd.It turned out to be a hard rd, and surprise, i again blew this. I managed to complete only 2 out of 8 Sudoku Puzzles. 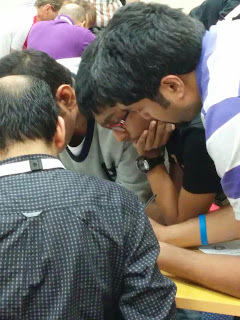 I have to mention that Prasanna,one of the top solvers in the country,was having a horror day by his standards, breaking Sudoku Puzzles left and right. As i felt i had already blown this day,i had a nothing to lose attitude,and that,believe it or not, saved my day. I resolved to put my full concentration in the remaining rds. And the next one was golden. I managed to solve 5 out of 8 moderate variants in 35 minutes, and was pleased with my performance. I did have a chance to save my day, after all. The last individual Rd of the day was a tough one to complete, and even though I did not do too well, i managed to solve 6 Sudoku Puzzles out of 12 in time, more than most in my team. Feeling way better, I readied myself for the team rds. By then results of three Rds had been posted online, and I had not broken anything! The team rounds went awry. We got only 1 Sudoku in both of them. Our A team too did not do so well. I did feel that we ought to have done better, given that none of us had done too well in the individual rds. I do feel that at least in future WSC's, we should give more importance to these rds to boost our team rank. GP playoffs took place and well, they were brilliant. It was superb to watch all the top guns in action, including our own Prasanna. Tiit Vunk swept to a fantastic victory, showing his mastery over both classics and variants. I felt tired after the end of all action on day 1. I had not done as well as I could. I made a silent promise to give my all on the morrow, and finish on a high. Day 2 began extremely well. Rd 10 was a classic round and I managed to finish it just in the last minute. I later learned that no one else from India managed to finish it, which gave me a good boost. But what followed was a complete nightmare. Rd 11 was the make or break round, a 90 minuter, with 16 Sudoku Puzzles and 1500 pts on offer. I had targeted at least half the points on offer,but completely underestimated the quality of the Sudoku Puzzles. They were too good and well, I was not up to that level yet. My confidence from finishing the previous Rd slowly vanished as I struggled to progress. I managed to attend a meager 402 pts, and later learned that I had broken an 86 pointer Anti Knight Sudoku. It had just gone from bad to worse. One of my biggest strengths was accuracy. I broke Sudoku Puzzles very rarely. But I failed where it mattered most. I had made 3 mistakes in all the rds put together, costing me about 150 pts. - Gappy Classics Sudoku. It didn't go well,to say the least (I scored 0). I was pretty clueless, didn't have any good strategy for it, and paid the price. It appeased me a bit when I learned that a lot of people had scored 0 in this. The individual rds were over, and thankfully, i had managed to finish in the top 100 ,at 94th position.I learned that had I not broken the Sudoku Puzzles that I did break, I would have finished in the late 70's,which was more of a rank I liked. I did take some solace from the fact that this was my debut and well, i could only get better from now on. Rohan was very consistent throughout the 2 days and finished a deserving 18th in the world. Prasanna, due to his bad first day, could only manage 21st. We sped through the remaining team rds. We did fairly well on both,when compared to the previous day's team rds. India A finished a creditable 6th, equaling their best ever performance. Our team finished 23rd. In the u18 category, i ended up at 10th position. Congratulations to Tiit vunk for becoming the world champion and to Czech republic for being the best team. 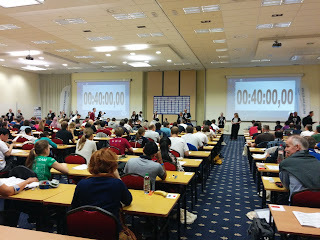 Overall it was a grand WSC, organized tremendously by Slovakia, with extremely good Sudoku Puzzles. On the performance front, it was mixed. On one hand we had no top 10 finish, but on the other, all of the A team members finished in the top 40, which is a huge achievement. It is now up to us, India, to host the 12th World Sudoku Championship, and make it an unforgettable event for all, just as this has turned out to be for me. For me, there is still a long way to go. I shall return next year, faster stronger and smarter. 1. 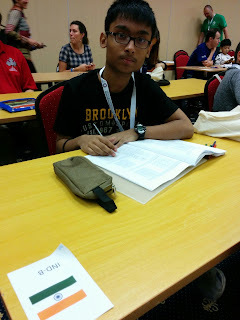 World Sudoku Championship 2009 Experience by Ritesh Gupta: Read out World Sudoku Championship 2009 experience by India's first and multiple times National Sudoku Champion Ritesh Gupta. 2. 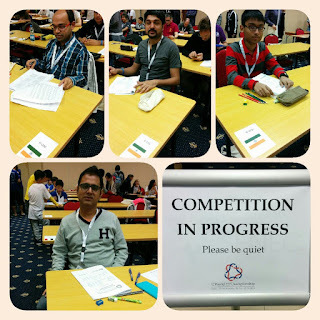 Puzzle Ramayan (PR) & Indian Puzzle Championship (IPC) 2017 by Hemant Kumar Malani: Read about the experience of upcoming young Indian player Hemant about PR and IPC 2017. 3. 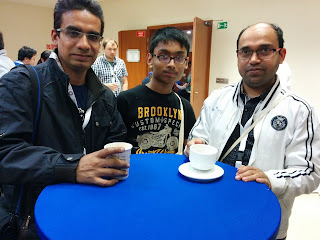 Sudoku Champs 2015: Pranav Kamesh and Hemant Kumar Malani who are India's young and bright Sudoku players got introduced to Sudoku and Puzzles World by Sudoku Champs 2015. Read about this championship which selected Indian young talent for World Championships. 4. 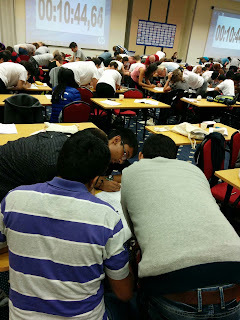 World Puzzle Championship (WPC) 2009 Experience by Harmeet: Read about WPC 2009 experience by one of the experienced puzzle player Harmeet Singh. Hai you did a great job. Proud of you. Good job pranav. Proud of your work. Well done Pranav. Too proud of you representing our country. May God Bless you to attain new heights with lot more successes. Very well done Pranav!! God Bless You with more such accomplishments!! Well written Pranav, congratulations on your performance! It's indeed an honour to be the only U18 to represent India. My only request is to use proper casing (I vs I) and using complete words (Round vs Rd) to make it easier for readers like me. I wish you the best! Well done Pranav, and nice write-up too.